Former Tourism and Hospitality Industry Minister Walter Mzembi is in a critical condition and according to his lawyer Mr Job Sikhala, he is unable to stand trial. He is facing $1.6 million theft of trust property charges. 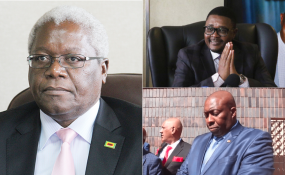 Mzembi's trial failed to kick off as he is said to be in South Africa where he is receiving treatment after being diagnosed with colon cancer. Mr Sikhala said Mzembi needed prayers as he is seriously ill.
Mr Sikhala said: " The circumstances are beyond all of us, I had to fly to South Africa to get my own personal assessment of the condition of my client on Saturday and my client is seriously indisposed to stand trial. Accused will not be able to stand trial, not in the near future. Join us in prayer so that he gets through this. It is something very serious and on the next date I don't think anything would have changed." Mzembi is jointly charged with two others and the State is now considering separation of trial. The matter was remanded to February 4.